AN elderly dog walker’s loyal pet dog could have stopped him freezing to death after he collapsed yards from a raging river. 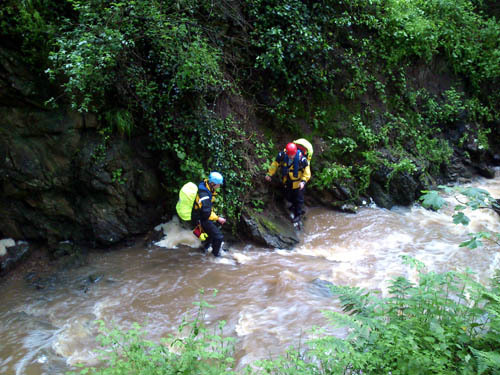 Jimmy Brown, 73, from Coldingham, Berwickshire, was found on Sunday morning after a major rescue effort. Despite the cold weather and fast-moving waters, Misty the border terrier stayed by his side and its warmth may have helped him last the night. The OAP was last seen on Friday morning when picking up his paper. But his family raised the alarm after they did not hear from him. A local farmer, named locally as Brian Curry, found Mr Brown suffering from “severe hypothermia” at 11.40am Sunday, but the faithful dog had not deserted him and was nestled up next to the pensioner. Rescuers could hear the straw-coloured dog barking as they approached him. It is thought Mr Brown fell into a ditch next to Hill Burn, but a fence prevented him from plunging into the cold water. The burn is just 500 metres from his house. Team leader Seymour Haugh, of the Borders Search and Rescue Unit, said he would have been lying next to the burn overnight. He said: “The burns were in a considerable spate. “A number of groups had been searching various areas. “We first had to extract him from the fence which probably stopped him going into the burn. “He was very stiff because he was very very cold. They had to get him warm. The 73-year-old was lifted out of the ditch and given oxygen, before being taken to paramedics. Mr Haugh continued: “He would have been lying there overnight, He might have been lying there longer. “He was responding to the team’s voice, he was drifting in and out of consciousness. “The dog was there with him. The dog was shacking at one point, but it might just have been nervous. A local farmer was the first to spot the pensioner with the straw-coloured border terrier. Stuart Fuller-Shapcott was one of the first on the scene, and treated Mr Brown. He said: “The dog was next to him and wasn’t on the lead. It barked which probably helped find him. “We moved him about 10 yards up the slope. He was laying right up to the fence, almost wrapped around it. “We had to get some heat into him so we put him in a survival bag and a casualty bag. 19 people were called in to help with the search. Mr Haugh added: “We were delighted to find he was still alive. Often you’re searching for someone you suspect is dead. Known locally as Jimmy, Mr Brown had lived in Coldingham for 20 years. At The Anchor in Coldingham, a man who identified himself as the owner but did not want to give his name, said: “He was a really quiet guy. Gordon Johnston, session clerk at the parish church in Coldingham, said: “I heard he had been missing for a while. A neighbour, who did not wish to be named, said: “He’s a really nice guy but he hasn’t been well in recent years. “Apparently he’s in a really bad way. They thought he was going to be alright when they found him alive. A Lothian and Borders Police spokeswoman said: “Police were alerted to the disappearance of a 73-year-old man who was reported missing from his home in Coldingham on Saturday night at around 10.30pm. “A large-scale search operation was undertaken and he was found around 11.55am on Sunday, in a field a quarter of a mile away from West Loch Road, Coldingham with his small terrier.